The PlayStation is a console created by Sony. The system featured many games that made use of the latest 3D technology, but also contained its fair share of sprite-based titles. 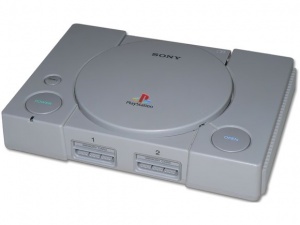 The PlayStation uses CD-based technology, meaning that all of the data found within a game can be read using a standard ISO viewer, or by inserting the disk into your computer and browsing it. As such, the console has a vast number of different formats that are used that require their own dedicated tools to view. Some common formats can be seen below. For more details on this program, please visit the PSX-vram page. The most used program for ripping PSX sprites, it will read save states from emulators and display it's contents. A tool capable of finding, displaying, and converting TIM files in games. There are a few plugins that allow it to view other file formats, but it is mostly used for TIM files. This can be helpful if you believe a game uses TIM files, but they are stored in an uncompressed archive file. This program is used to extract sound effects and music from a Playstation game's ROM. It can also convert audio files into uncompressed .WAV files. For more information, see PVV. Another program that uses Save States to view content in and around the saved data, only it accepts save states from any Playstation emulator that contains them. For more details on this file format, please visit the TIM page. The .TIM file format is a common format for both sprites and textures. A common video format. Generally used for cutscenes, introductions and credit sequences. A common audio format, mostly used for music, but can also be used for sound effects. Mednafen emulates the PS1 and is very accurate. It doesn't need plugins making it easier to set up, no (or very little) hacks used, plays music from multitrack games and has the PS1 boot up animation when booting up a game. If there are problems running a game, then it is usually a case of a bad ISO/BIN+CUE dump, a dodgy cue file or even the game itself. Some even consider this emulator more accurate than Sony's official one that was used on the PS3 and the PSP! It does require a certain kind of BIOS though to run the games, it is command-line even though frontends exist for the program and requires a more powerful computer than the other options. If it is too complex, it is also available as a core for RetroArch under the names Beetle PSX and Beetle PSX HW however these have bugs that the official version doesn't have. It does have extra features though such as overclocking and able to run at a higher resolution. BizHawk also uses this for their PS1 emulation however it is based off an older version and might not have the fixes that are in newer versions. Probably the most well-known PSX emulator as it has been around for a long time and also has an Android version. It has good compatibility and performance with most games, even though it does include hacks for specific games such as Valkyrie Profile. However like some PSX emulators, it will not play the music from multitrack games (such as Pac Man World or Real Bout Special Dominated Mind) or certain kind of ISO/BIN+CUE dumps. This page was last edited on 7 January 2018, at 16:11.